Janet Fox writes award-winning fiction and non-fiction for children of all ages. Her young adult debut novel, Faithful, was an Amelia Bloomer List pick, and was followed by a companion novel, Forgiven, a Junior Library Guild selection and WILLA Literary Award Finalist, and Sirens, a 1920s noir mystery and romance. Her middle grade debut novel, The Charmed Children of Rookskill Castle, launches March 2016. Janet is a 2010 graduate of the MFA/Writing for Children and Young Adults program at Vermont College of Fine Arts, and a former high school English teacher. She lives in Bozeman, Montana, where she and her family enjoy the mountain vistas. Click here for more books by Janet Fox. 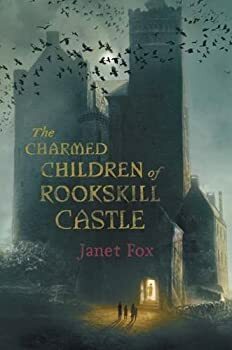 The Charmed Children of Rookskill Castle, Janet Fox’s middle-grade fantasy adventure has a smart, feisty girl hero; it has clockwork steampunk, the London Blitz, spies, sinister rooks who seem to be speaking, and magic. And lots of atmosphere! Katherine Bateson, who goes by Kat, is the oldest of three children and her watchmaker father’s favorite. It is World War II, and America hasn’t entered the war yet. The Blitz has made London unsafe and many families are sending their children out of town. In addition to fixing watches and clocks, Father also disappears into dangerous parts of Europe, and that “job” can only be discussed in hints and codes.